Apple Pro Wireless Keyboard includes shipping! Apple Bluetooth Wireless Keyboard. Uses 4 AA Alkaline Batteries (included), on/off switch. System Requirements: A Macintosh with a built-in Bluetooth module or an external USB Bluetooth Adapter. Features 15 full size Function keys provide a variety of short cuts to common tasks, convenient multimedia keys and full-size keys for Page Up and Down, Home and End, Insert and forward Delete. Mac OSX v.10.2.6 or later. Used fully tested 30 day warranty. Our $59.77 price includes domestic shipping. MacAlly iKey Slim USB Keyboard - $49.77 includes shipping! 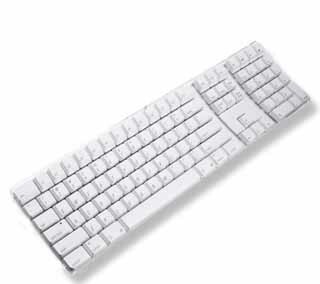 Macally iKeySlim is a stylish and clean white slim USB keyboard. Enhanced low profile keycaps reduces key stroke travel distances and eases pressure on your finger tips. Preferred by modern typists it has more the feel of a laptop keyboard yet is full size. 104 key slim USB keyboard with thin key caps with sensitive and responsive touch. Convenient 2 Built-in USB ports, CD Eject and volume control buttons and a nice ice white finish to match your Mac. Not all features available in OS9 but works fine. OSX compatible. Style may vary from picture. Requires a USB capable system. Approx. Dimensions: 18.5"x1"x7" with 5' cable. Your price is $49.77 includes shipping. USB 2.0 hub and card reader supports read/write to SD and microSD memory cards. Supports most smartphones, tablets and platforms with OTG function both Mac and PC systems. 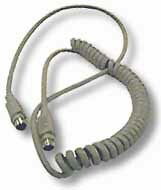 USB 2.0 type A male/USB mico type B male combo connector, 7-inch cord length. Specifications: Two (2) USB 2.0 ports, One (1) microSD card slot, One (1) SD card slot. Works in all Macs with USB ports. Our $12.77 price includes domestic shipping. Optical Wheel Mouse USB NEW! BEST MAC MOUSE for the money! $19.88 shipped! For the money I think these are the best USB Optical Mac Mouse available. 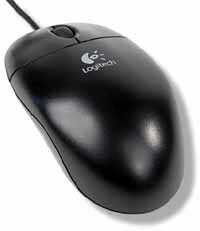 Logitech´s optical mouse is now available! Optical means there are no balls or rollers to clean! This 2 button with scroll wheel 800dpi Optical Wheel Mouse combines the latest in optical precision from Logitech with USB connectivity for maximum user flexibility. Glide smoothly across most work surfaces  no cleaning required. Works on any USB capable Mac. Drivers available for OS8.6 - 9.2.2 on the Free Kitchen Sink CD we ship with your order. OSX requires no additional software, just use the X built in mouse control for setup. DO NOT install the Logitech OSX drivers (they disable the mouse). Our Price $19.88 shipped! We are substituting good clean working MacAlly Mice at this time. Sell us your old working Apple ADB Oval Mouse. Cosmetically challenged. Fits older beige colored Mac systems and likely is the same as you are replacing. Apple label. Used, cleaned and tested in good condition. Our $29.99 including domestic shipping. These are getting hard to find. If you or you know of someone with a quantities of these we are paying top dollar for your used working mice. Apple ADB Rectangle Mouse. Cosmetically challenged. Fits older beige colored Mac systems and likely is similar to what you are replacing. Apple label. Used, cleaned and tested in good condition. Our $19.99 price includes domestic shipping. Limited quantities. We buy your old mice! One Touch Multimedia Selection Switch - New! Super Useful Item! Want to instantly listen to music or talk on the Internet phone in private? Connect our multimedia selection switch to your sound port, and then plug your speakers, headset and microphone into the switch. Now privacy is as simple as pressing one button! You'll never need to reach behind your computer again! Comes with 3 jacks: 1 for speakers and 2 for the headset with mic. This product switches between the headset and speakers. Perfect for classrooms or public computer systems. Connects using standard audio connectors 54" stereo connection cable. Only 2.5" in diameter. Special $19.77 includes shipping. Apple ADB keyboard and cord. Cosmetically challenged. These were used with the SE's and Mac II's originally but work fine with any Mac that has an ADB port including Performa's, 6100-7100-8100, 85/8600, 95/9600, G3 Beige, etc. The smaller footprint (16"x6") takes up less space on your desktop although you lose the function keys. Apple label. Used, cleaned & tested in good condition (all are discolored by age). Our Price $24.77 includes shipping. iMic, USB audio interface - High quality USB to audio adapter. New $39.77 + $6.00 shipping. Make that Headphone/Mic thing you bought work with your Mac! 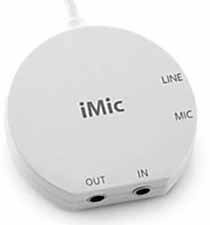 The iMic universal audio adapter is a USB device that allows the connection of virtually any microphone or sound input device to the iBook, G4 Cube, Titanium PowerBook G4 or any other Mac with USB ports. Currently shipping, the iMic supports both line and Mic level input as well as line level output for any USB capable computer. By using USB, the iMic provides significantly superior audio input and output performance over built in audio. The iMic is a must have product for people who are serious about getting high quality audio in or out of their computers. Key Features: Supports better than CD quality at up to 48 Khz sampling. Works with virtually any microphone including unpowered (Mic level) and powered , Mic Level Microphones, Multimedia devices, Headsets, Communications devices. Audio Input: 1/8" (3.5 mm) stereo line/mic-level. Audio Output: 1/8" (3.5 mm) stereo line-level. 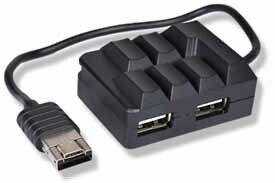 Computer Interface Plug: Type A USB. 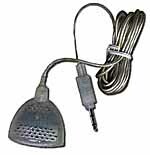 Hardware Control: Slider switch to select mic or line level COMPATIBILITY: requires Macintosh with USB port, Mac OS 9.0.4 or greater, 10.4 or later to use with their software. Allow 3 to 5 days shipping. Our price: $39.77 + $6.00 shipping. iMac puck mouse. 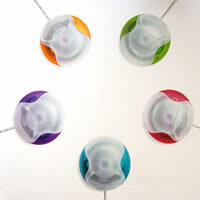 Assorted colors, our choice, USB. Works with any Mac that has available USB ports. Used, tested, cleaned. $14.77 includes domestic shipping. Rare USB Ball Mouse, Various Brands, some single button, some double button. Used, tested working. Drivers available for some. Work under OS 9 and OS X. I still prefer the precision of a mechanical mechanism when doing delicate work. Perhaps you will too. Our $14.77 price includes domestic shipping. Apple PlainTalk Microphones. Compatible with all desktop PowerMac Apple and Mac Clone models. The following computers are compatible. Apple Computer: iMacs, Blue & White G3s, G4 All AV models (NO CUBE) (660AV, 840AV...) Performa/Quadra 475, 476, 605 PowerMac 61xx, 71xx, 81xx Performa/LC 520, 550, 560, 57x, 58x, 63x, 640 Performa/PowerMac 44xx, 52xx, 53xx, 54xx, 62xx, 63xx, 64xx PowerMac 7200, 7300, 7500, 7600 PowerMac 8200, 85xx, 9500, 9600 PowerBook 3400 All Workgroup Servers. They work with most all clones including Power Computing, Umax, APS, Powertools, MacTell, etc. These are an exceptional value and are new in the package! Shipping included. Clear Apple PlainTalk Microphones. Transparent plastic looks great with your iMac or G3/G4 Towers. Compatible with all desktop PowerMac Apple and Mac Clone models. The following computers are compatible. Apple Computer: iMacs, Blue & White G3s, G4 All AV models (NO CUBE) (660AV, 840AV...) Performa/Quadra 475, 476, 605 PowerMac 61xx, 71xx, 81xx Performa/LC 520, 550, 560, 57x, 58x, 63x, 640 Performa/PowerMac 44xx, 52xx, 53xx, 54xx, 62xx, 63xx, 64xx PowerMac 7200, 7300, 7500, 7600 PowerMac 8200, 85xx, 9500, 9600 PowerBook 3400 All Workgroup Servers. They work with most all clones including Power Computing, Umax, APS, Powertools, MacTell, etc. These are an exceptional value and are new in the package! Shipping included.